Titan Peeler Pro Reviews: Does it Work? Titan Peeler Pro, also referred to as Titan Pro, is an As Seen on TV peeler which is advertised as “the best slicer you’ll ever own.” While the Titan Peeler has been available for many years, the Titan Peeler Pro has only appeared in recent advertisements in 2015. The original Titan Peeler first appeared online in 2008, marketed by Tristar Products Inc. The official product website is titanpeeler.com. By late 2014, the product website was forwarding to Tristar’s website, or stating that the “offer is currently not available.” In 2015, it was relaunched with the Titan Pro as its only offering. You can get the Titan Pro online for $10 plus $6.99 for a total of $16.99. Additional sets can be included for $6.99 shipping per set. A “Step By Step Garnishing Guide” is also included with every order. The original Titan Peeler is readily available in stores such as Bed Bath and Beyond for about $15. It is not clear if the Pro version is available in stores as of this writing. Perhaps the biggest question regarding the Titan Pro is what advantages it holds over the original Titan Peeler. Unfortunately, neither the website nor the advertising addresses this glaring question. The original Titan Peeler is rather highly rated on virtually every online store, such as Amazon, where it boasts a 4 star rating among 100+ customers. Even several years later, comments can be found on review sites and on YouTube by customers who are pleased with the product, citing it as effective and long lasting. 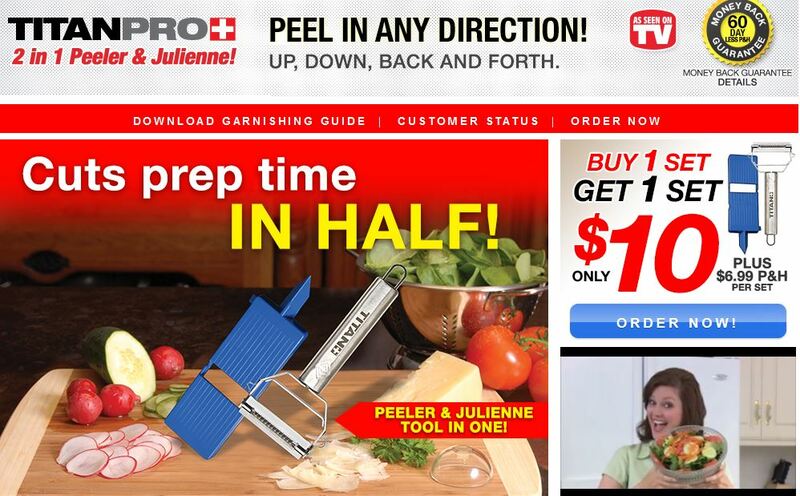 Due to the original’s overwhelmingly positive reviews, and the lack of clarification as to what advantage the “Pro” has over the regular Titan Peeler, it is difficult to ascertain why consumers would want to purchase this product online over the original which is easily found in stores. We have reached out to the product’s customer service department and will update this page with their clarification regarding the differences between the original and the Pro models. Perhaps the closest product you’ll find to Titan Peeler is another As Seen on TV product called the Miracle Peeler, which is also currently advertising on television. That product appears to be a knockoff of either Titan Peeler or another “Miracle Peeler” by Gourmet Trends, whichever came first. Miracle Peeler has a plastic handle, which is the most obvious difference in design. Titan Peeler Pro is a new version of the popular Titan Peeler which has been available since 2008. It is unclear what advantage the Pro version holds over the regular version, as this is not addressed on the website on in the television ads. Customers who have purchased the original Titan Peeler are generally pleased with that product. We are attempting to clarify the difference between the Titan Peeler vs Titan Pro, and will update this page when we receive a response. If you’ve used Titan Pro, please leave it a star rating above and a comment below. Gotham Steel Review: Does it Live up to the Hype? it has both options now in the same one! It is the equivalent of the 2 others merged in only one.